With today's server save we have released one of the missing bosses and two new powerful items for mages. New Promocodes have been spread ! 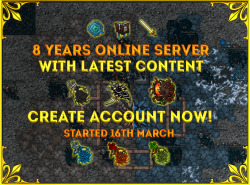 Come join our server and join the adventure! MOTA (museum of Tibian Arts) Goldhanded Cultists spawn is now only possible to access after slaying one of Cults of Tibia bosses, this spawn was way too abused by money makers so we had to make a change. We want to mention that the chance of rolling those items is very rare. As we had a few issues this week and we want to apologize, and also make some recompensation to those who started later or we want to force coming more newcomers, we are enabling 30% experience boost for lower level characters during this weekend! 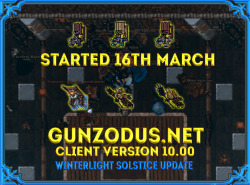 Also, we want to pre-announce Winterlight Solstice update and new Percht Raider outfit is going to be released soon! New record: 1028 players are logged in. Free New Promo codes for new players! Ordnance Warzone 4 task is now available, NPC Gnomus wants your help rescuing some Lost Gnomes and Gnome Pack Crawlers that are bringing new ordnance to the base. Can be repeated once per 4 hours and reward is 2 surprise jars and 1,000,000experience points as all other Warzone 4, 5, 6 tasks. Viewbots is the cheapest and most reflexing type of advertise, we are turning on this kind of advertising only during a special raids/events or experience boost weekends and so on. This was the first time we've ever tried this views feature and it's worth morethann other really expensive advertisements which we usually used/use. 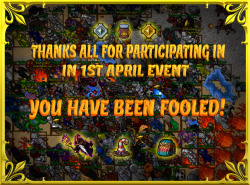 Yesterday there was 1st april fooling players event ran thanks to all who joined our custom fun event . We hope you had fun. See ya in-game new features and updates are incoming! Foolumbras has been slain, congratulation to who participated. Small glitch at Ordnance Warzone 4 task where monsters were teleporting back to their spawn was removed and it's now fully working. We want to remind that ALL new warzone tasks can be repeated once per 4 hours and reward at the end of each task is 2 surprise jars and 1,000,000 experience points. Gnomal Warming Measurements task is now available, NPC Gnomus wants you to measurement five areas around Warzone IV task area with gnometrignometre. This task as all others can be repeated once per 4 hours and reward is 2 surprise jars and 1,000,000 experience points as all other Warzone 4, 5, 6 tasks. 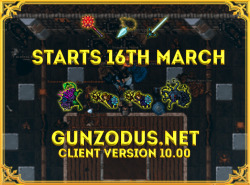 There is some error happening on Gunzodus right now. We are working on fixing up the issue ASAP. After the issue will be fixed there will be 50% experience bonus activated for rest of the day. The Lightbearer - In that special time of the year when the veil between the worlds is thin and darkness is striving to break through, Lucius calls for Lightbearers to keep sacred light basins burning for four days. In that special time of the year when the veil between the worlds is thin and darkness is striving to break through, Lucius calls for Lightbearers to keep sacred light basins burning for four days. This event ends 10/4 try your last chance today or never. With tomorrows update there will be enabled instead our new boss The Percht Queen! It's a low lvl area/boss but the mechanics are pretty difficult check more info on wikia for those who never heard of her. Reward for this boss is full Percht Raider Outfit! Winterlight Solstice - The Percht Queen! As we have pre-announced before about the even for one of the latest global outfits it's finally here. You need to infiltrate with Percht inhabitants first, find the way how to cheat them and prove that you are worthy to challenge The Percht Queen. After completing whole low-level questline you'll be rewarded with Percht Raider outfit and have a chance of looting one of the rare mounts!